I’ve spent a few blog posts over the last year or so looking at how the research around positive emotions and outlooks connects with more effective collaboration and change work (see “Accentuate the Positivity”: Part 1, Part 2, Part 3). Just a couple of weeks ago, inspired by Erik Gregory’s LeaderLens presentation, I considered the connection between positive leadership and sustainability, looking at the way in which the creation of positive environments might lead to greater adaptive capacity. Having recently explored more of the research of psychologist Barbara Frederickson, I see a greater case to be made for maintaining positive outlooks, individually and collectively, as they increase our ability to engage in creatively adaptive and regenerative work at deeper systemic levels. Frederickson has carried out years of research, trying to understand the value of positive emotions. Up until her contributions, much of the scientific work around emotion had apparently privileged negative emotions. It was easier to understand how fear and anxiety aided human survival in the moment (“There’s a saber tooth tiger – run!”). In comparison, positive emotions came across as pleasant window-dressing. Then Frederickson developed her theory about how positive emotions (joy, serenity, interest, pride, awe, hope, gratitude, inspiration, amusement, and love) broaden and build human resourcefulness. Over time, she has come to see that positive outlooks open our hearts and minds, stimulating curiosity about and engagement with the world. Relatively speaking, negative and even neutral outlooks constrain our experiences and knowledge. The long-term implications are that we stand to learn more that might serve us in the future when we experience a higher ratio of positive to negative emotions. The tipping point, in Frederickson’s work, is a 3:1 ratio (note that negativity and neutrality are still necessary and useful, otherwise we are talking polyanna and being farsighted). From here there is a greater likelihood of flourishing in terms of building new skills, ties, knowledge, and ways of being. I’ve been mulling this over in the context of systems thinking and change work. 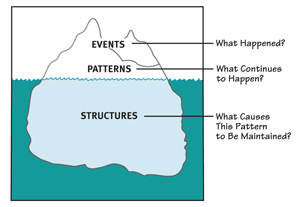 From a systems thinking point of view, we can look at the world with an event, pattern, or structural orientation. Focusing on events means responding to things as they arise, putting out fires when they happen. With a pattern focus, we look for connections between events, considering trends over time, and anticipating how these might impact the future. A structural outlook takes this to a deeper level and asks, “Why do these patterns exist?” What beliefs, policies, cultural elements, institutional arrangements, etc., contribute to said pattern? At this level of inquiry, there is greater leverage to be found in the deeper roots underlying single events or emerging trends. People most often operate from an event orientation, perhaps owing to our strong survival (fight or flight) instincts. What enables us to think from more from a pattern or structural level? In part, getting away from a pure urgency and “in-the-moment” mindset. Could positivity be a key to opening broader and deeper systemic inquiry? Are certain advocacy/activist mindsets ultimately limiting? Could a positive outlook be a moral obligation? Is it an evolutionary imperative? To answer your question, my opinion is that a clear-eyed (as in, let’s not deny Global Warming) positive outlook is an evolutionary imperative. More broadly, as I read this brilliant post I am applying it to recent OD experiences in which a commitment to a structural perspective (which I think is essential) actually ends up looking quite dry and heartless if not all toghether negative. Great question, Gibran. I too have been in the midst of structural conversations that just seem to squash possibility, pit people against one another, etc. I have been leading with the systems thinking mantra, “curiosity, not blame.” Encouraging a real genuine interest in underlying causes as a way of expanding our mutual understanding and humanity is where I think the connection lies between positivity and structural analysis. Playing the blame game, “gotcha,” and trying to prove you are right or smarter is not the spirit of positivity. What’s the mindset we bring to the systemic/structural conversation? This seems very relevant to the persistence or resiliency of activists, entrepreneurs or change agents. Their failures usually out number their triumphs so what emotions keep them going? And is it the frequecy of their positive emotions or the way they choose to focus and emphasize on a disposition (treating individual emotions as events but perceiving a positive pattern?) How would we collectively fare if no one had that inspiration? Good question, Mark. And it seems our ancestry has us tipping towards old habits of being, looking out for trouble in ways that belittle us. I’m very interested in how we can collectively create conditions for shared positivity, adaptability, and innovation! Exploring patterns and why they exist almost inevitably tend toward exploring the negative. I think the important counterweight is remembering what we want (positive vision of the future) and our capacity to move toward that. Thanks, Cynthia. I think the point the positivity-ists 🙂 are trying to make is that while we may be exploring negative trends, we are doing it with a spirit of curiosity, attempting ultimately to improve the situation without getting mired in despair or blame. It’s kind of like the difference between listening to understand and listening to make someone else wrong. And to build on what you, Mark, and Cynthia are saying, I think the Profile of the Facilitative Leader is key as well. This really emphasizes the collaborative, strategic, and receptive spirit we bring to all of the spaces. Hmmm…I think its positive approach is indeed the right(eous) and the smart approach, especially in light of the evidence (of all kinds) to support that we as humans thrive, produce, and interact better when there’s a positive vibe and perspective — great! Not sure that the “evolutionary imperative” or “moral obligation” frame it is resonating with me…likely because I see it more of a choice that we have, than an obligation we fulfill (moral), or are pulled by (evolution) that makes this happen in our lives and work. Perhaps Im not reading these differently than intended. For me, this posititivity about the choices we make (a design question) which I see as a matter of intention, aspiration, choice, self-determination and vision…and not (perhaps due to my theological leanings) an eventuality. Our future, in each encounter, each community — is about a conscious choosing, creating, striving that can come from more of a positive place or a not so positive place (and all those places in between)…that is ours to embrace…or not. An activist can choose it, or not. A clergyperson can choose it, or not. A therapist, a family, a neighborhood, a immigrants rights campaign, a nation…. Good points, Melinda. And there is some interesting scientific research that suggests that positivity is an evolutionary imperative, key to human survival. And I suppose it is a choice whether or not we choose to do what is in the best interest of our continued residence on the planet. To the extent that our siding with the way of Life is a moral choice, well then perhaps that is a way of looking at it . . .